I had previously used Application Insights, but no longer do, however the App Insights code remained in my app. I noticed when I recently migrated hosts and upgraded to .NET Core 2.1.0-rc1 that the CPU usage gradually increased over the course of a few days. 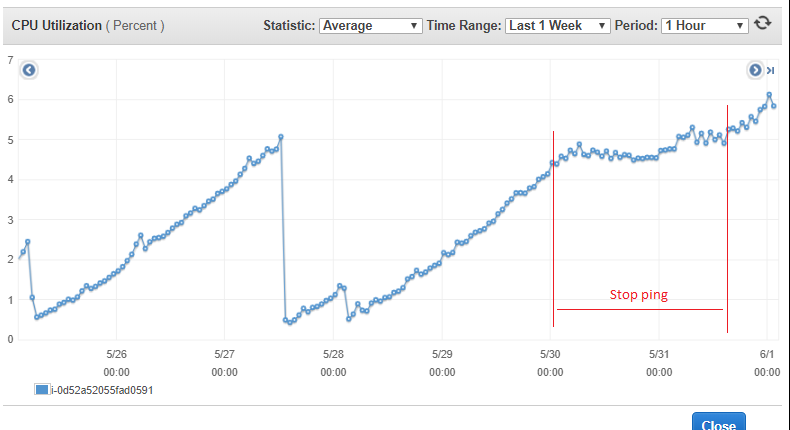 The drops back to 0 are Docker container restarts. 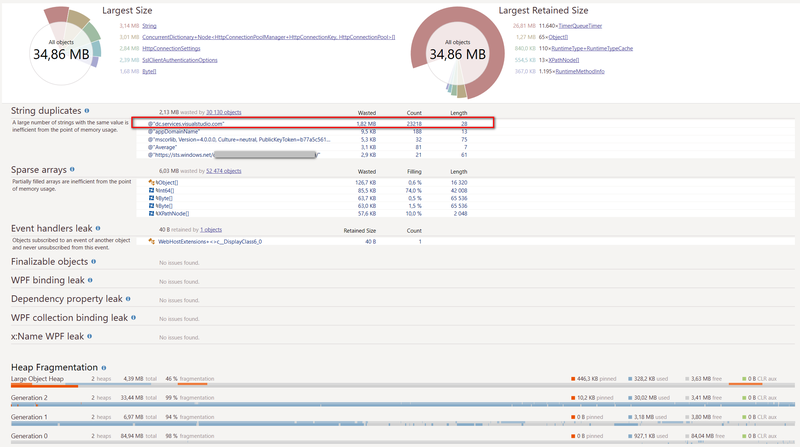 Removing Application Insights from the site results in a steady almost-zero CPU usage. See also this Twitter thread, though there's not much more there. Thanks for reporting. We'll try to setup a repro and investigate more. What was the version of application insights SDK which you used? 2.3.0-beta2, running on an ASP.NET Core 2.1-rc1 app. On Wed, May 23, 2018, 3:08 PM Cijo Thomas ***@***. ***> wrote: Thanks for reporting. We'll try to setup a repro and investigate more. What was the version of application insights SDK which you used? — You are receiving this because you authored the thread. Reply to this email directly, view it on GitHub <#690 (comment)>, or mute the thread <https://github.com/notifications/unsubscribe-auth/AAL9OE-fJkMOt_09ld_JL3Tl9Vhj0MMoks5t1bPEgaJpZM4UFhGL> . Similar for app in .net 2.1 for last 3 days. I'll setup something for linux now. Thanks for reporting this. We will setup a linux test to do deeper investigation soon. Have an asp.net core 2.1 app with AI SDK 2.3, running in ubuntu 16_04. A script is pinging the app once every 10 sec. WIll let this run for few hours/day and check again. 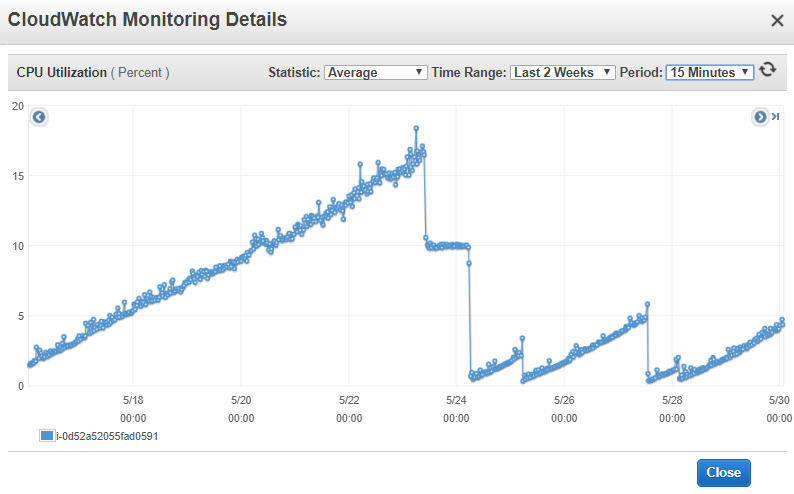 When we stop pinging, the CPU usage is no more keep constantly increase. Not only CPU but also Garbage collector affected. You can see changes in attached images. repro-ed on linux vm. Need to investigate more. Could you take a look at your handle count and confirm if you have the same issue or not? I'm recently having issues with increased memory usage. I checked it with dotMemory and I've seen many System.Net.Http related objects - e.g. open handlers that haven't been closed etc. I'm not yet sure if it's Application Insights though (I will do some more tests next week) - but if it is, maybe this clue helps finding the issue. I also have increasing CPU which seems to be from HTTP. It was not noticeable until I went to production which looked great after deployment, but a few hours later everything was redlined due to ever-increasing CPU demand as shown below. Unfortunately, this is a show stopper and is forcing me to rollback. We've downgraded Application Insights back to v2.2.1 and don't see the increasing CPU and memory usage anymore, so I can confirm that this is an issue with Application Insights. @flagbug Thanks for helping narrow down to 2.3.0. We will prioritize this investigation. I now also ran our application without App Insights for a few days and I don't see any stale Http-related objects in memory so I'm also "blaming" Application Insights for now. @cwe1ss Were you facing issues in linux or windows or both? My setup: Windows Server 2016 on Azure (Standard_D11_v2, 2 cores 16GB RAM); Single-node Service Fabric cluster (development system); I'm running ~ 60 .NET Core apps (~ 30 ASP.NET Core apps, 30 console apps); services are communicating via the Service Fabric HTTP reverse proxy. As it's a dev system, there's very little load on the system. I took a process dump of one ASP.NET core Web API project. The process has been running for "2 days 20:49:36". dotMemory gives me the following overview. 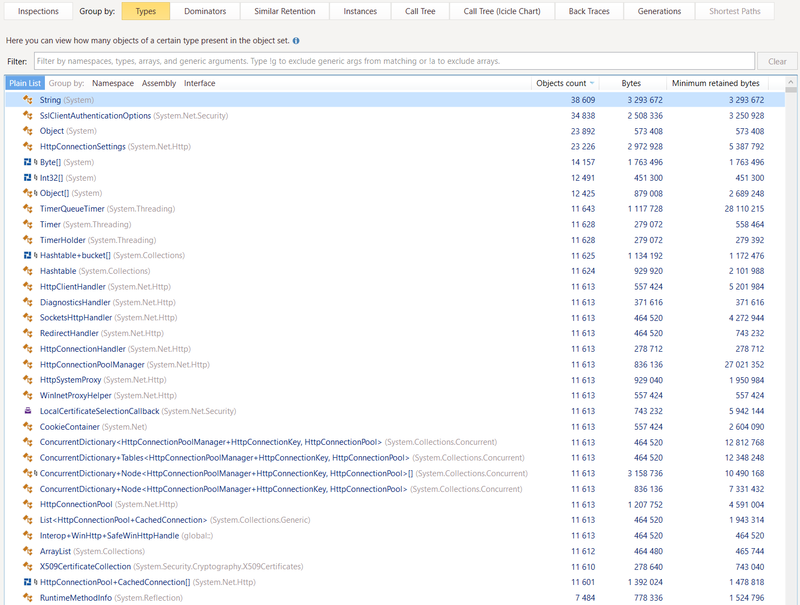 As you can see, the string value "dc.services.visualstudio.com" exists 23218 times. Looking at the type list shows that "System.Net.Http"-related objects make up the top of the list. 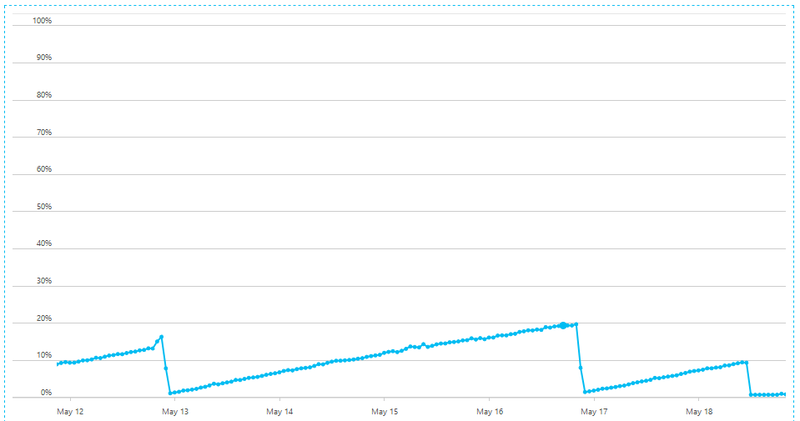 I do not see a similar pattern in an app where I've disabled Application Insights. @cwe1ss what are the back traces/call tree like on some of these objects? 11,613 object count ones are interesting; especially since it looks like there are 11,613 sets of HttpConnectionPoolManagers and 11,613 x List<HttpConnectionPool+CachedConnection>. That's not the number of cached connections; but the number of caches for connections. @benaadams can I get this from the process dump via dotMemory / WinDbg or do I need to trace this with PerfView / dotTrace ? oh... I've seen the tabs in dotMemory... but they are empty and just say "No allocation info was collected during profiling". So I guess I need PerfView / dotTrace, right?! I clicked around a bit more in dotMemory (I don't know much about it, sorry) and I've seen that you can get more details about the object instances. 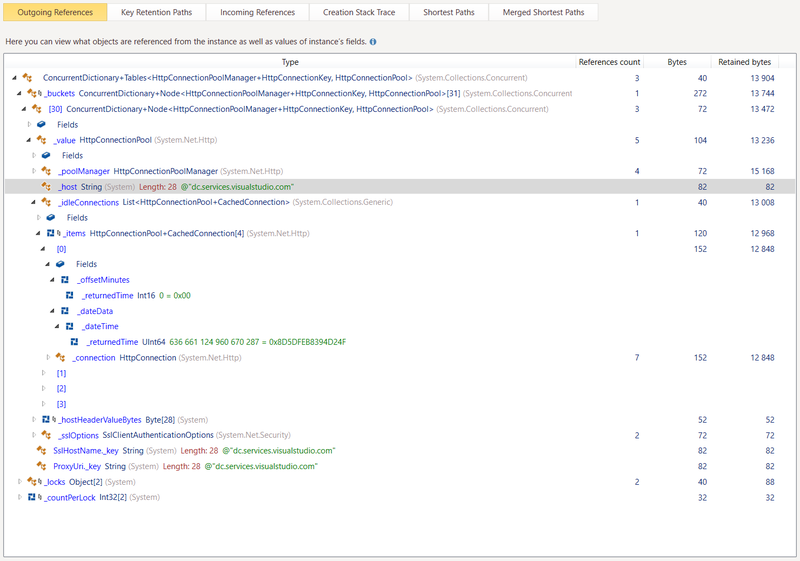 Here's some screenshots for a random instance of System.Collections.Concurrent.ConcurrentDictionary+Tables<System.Net.Http.HttpConnectionPoolManager+HttpConnectionKey, System.Net.Http.HttpConnectionPool>. I'm guessing the CPU increase is from the constantly increasing number of Timers; from scanning the list of active timers to work out which ones to trigger; which your memory dump seems to indicate. Timers also act as GC roots, which is why everything is probably hanging around, if their callbacks are capturing state. @Meenakshise The issue we addressed here was specific to .NET Core apps only, so i don't think this will help you. Either way, we always recommend using the latest version to get all the bug fixes etc. Could you try to use the latest stable/beta, and report back if you have high CPU usage issue. https://www.nuget.org/packages/Microsoft.ApplicationInsights.AspNetCore/2.4.0 - Stable is released which has fix for this issue. Please try out and let us know if any issues are found! Thank you everyone! New Microsoft.ApplicationInsights.AspNetCore@2.4.0 is good from our side (after more than 24h running). updating to 2.4.0 has fixed the memory leak issue. Any explanation on what was the issue? I upgraded to the 2.4.1 and it still has the leak which increases over time. Second screenshot showing the increase ratio where 600% is a hardware limit, after some time AspNetCore app working only on the leak. @Svisstack what version of .NET are you running on? High CPU usage in the HttpHeaders Dictionary'2.TryGetValue would suggest concurrent reads+writes to the header dictionary. If this is true, it looks like a major bug in app insights; why someone would put a SpinLock-like reader around the dictionary item which could not exist. I had an idea to create a workaround and still keep the app insights, with disabling dependency tracking to avoid this issue to happen as it's related to the database dependency, however it looks like there is no option to disable dependency tracking. why someone would put a SpinLock-like reader around the dictionary item which could not exist. The dictionary for the header collection is reused for each request on the same connection; so at the end of the request it is cleared. If that clearing happens while another thread is reading the header collection (e.g. it reads it outside of the normal request flow); then the read can go into an infinite loop as the arrays inside the dictionary are changed (Dictionary's are not threadsafe for a concurrent write with any other operation on it). In .NET Core 2.1 it will detect the infinite loop being formed and throw an exception; though it won't fix the concurrent use. @benaadams Thanks for detailed explanation. I understand now what's happening, but didn't see a clear solution/fix for this as it looks like the bug is actually in the AspNetCore which allows concurrent access to the dictionary instance which is not thread-safe ofc. Well... even if concurrent access was prevented (at a performance cost); it still wouldn't help as the data it read would still be wrong. At a guess... Looking at the stack from dotTrace, it could be a Sql query that's started as part of the Request; but not awaited as part of the request, so the response is sent before the Sql is completed. It could also be a Timer that's started to periodically poll and lazily started as part of a Request. When it completes it would then be trying to log the shallow copied (i.e. 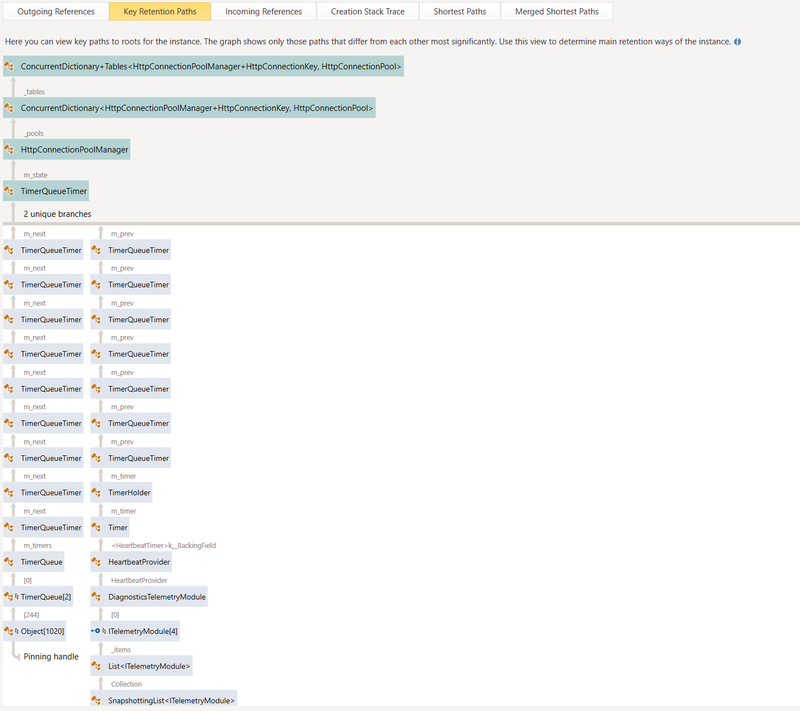 reference to) the captured Request data as part of the Application Insight's Telemetry event; using the mutable Request information that has now changed and is no longer valid for the event. I'm not entirely sure how FrameworkSqlProcessing.OnEndExecuteCallback accesses the Headers collection, though it looks to be part of the DependencyTelemetry object. @benaadams Thanks, I actually found the Tasks which can and probably are ending after the request is finished and they contain the SQL code, I will wait on them and report about the state of the issue after deploying the new version today. Based on your very useful input, I think it's still issue in the AspNetCore as it should not provide functions which delivering possible random data, if Headers dictionary is shared between requests then function for accessing that headers should have required some kind of request ID (static long incrementing every new request) based on which internal function could decide that these headers no longer exists and throw an exception instead of providing random data. However, while that may help with the CPU issue; it would also mean the telemetry from OnStart would be disconnected from OnEnd; if its using anything in the headers or HttpContext to connect them (as OnEndXxx wouldn't have this information). What should probably happen is Application Insights during OnStartXxx; which happens during the request, should deep copy the information it needs from the context/headers (e.g. key, values) as the strings will remain valid being immutable. Then OnEndXxx should use that same copied object to get the headers which were captured at the start of the event. @benaadams Removing the Tasks with SQL code that could end after the request solved the issue. Many thanks, I really appreciate your input here. So it's no action needed here as there is a new interface which didn't have this issue? I want to make sure that we should fix that for the community, or at least in known Insights bugs should be information that no dependency should end after the request is already finished. Well I do think AI should collect the information it needs on event start (i.e. key,value for headers); then use that collected information for event end; rather than rereading it from the HttpHeader collection; which should solve this issue more holistically. @benaadams Can you then reopen this issue? Can you then reopen this issue? @cijothomas Can you reopen this? We still have bug in insights related to this problem. 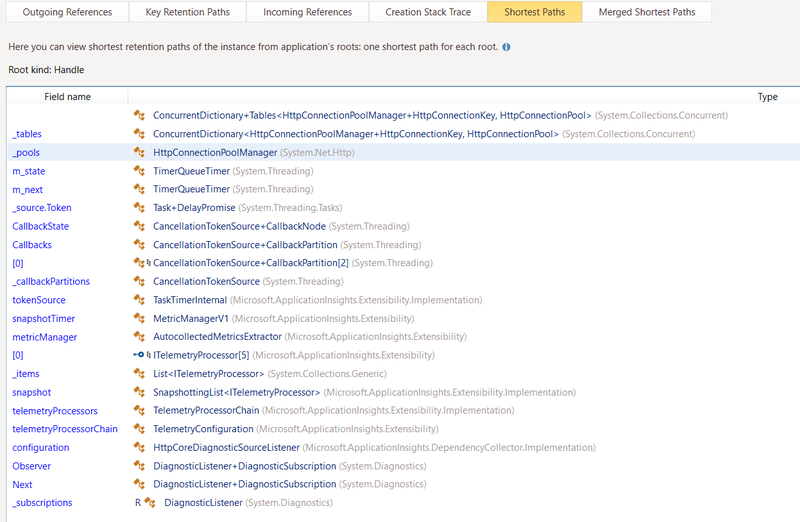 @Svisstack Can you open this issue in https://github.com/Microsoft/ApplicationInsights-dotnet-server/issues? @Svisstack thanks. Will discuss on othed thread. How did you solve that with this way? Could you share any code detail? @turgay I was able to wait on all the tasks or rewriting a sync code into the sync one before the request ended, in the future I could not probably do that then I believe migrating to the other lib or waiting for the fix are the only options. On 14 Dec 2561 BE, at 00:32, Turgay ***@***. ***> wrote: @benaadams Thanks, I actually found the Tasks which can and probably are ending after the request is finished and they contain the SQL code, I will wait on them and report about the state of the issue after deploying the new version today. Based on your very useful input, I think it's still issue in the AspNetCore as it should not provide functions which delivering possible random data, if Headers dictionary is shared between requests then function for accessing that headers should have required some kind of request ID (static long incrementing every new request) based on which internal function could decide that these headers no longer exists and throw an exception instead of providing random data. Hi @Svisstack, How did you solve that with this way? Could you share any code detail? — You are receiving this because you were mentioned. Reply to this email directly, view it on GitHub, or mute the thread.